We are a full service wood work company. We specialize in home improvements, interior remolding, custom cabinetry, kitchens, bathrooms, closets, moldings, basements, painting, decks, porches, framing, sheet rocking, plastering, and floor work. All our services are available for the New York City area, 5 boroughs and Long Island. We have started, completed and delivered some high scaled projects and small size jobs. No matter what the size, we have always found a way to make the client's vision become a reality. Since 1999, our first generation family owned business has been striving for great customer service, quick delivery on projects and competitive pricing. Healy Wood Works has worked with homeowners, small businesses, dentists and doctors that had wanted remodeling and complete renovation. 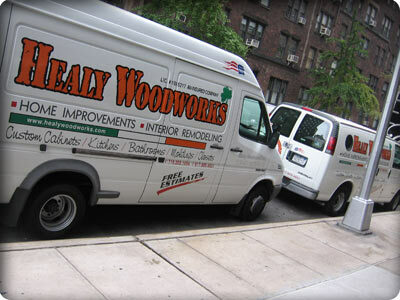 The entire Healy Wood Works staff are well trained and certificate holding carpenters.